I’m a long-time lover of musicals, growing up on the classics. I can recall the first time that I saw the made-for-TV version of Roger’s and Hammerstein’s Cinderella. I immediately fell in love with the music. 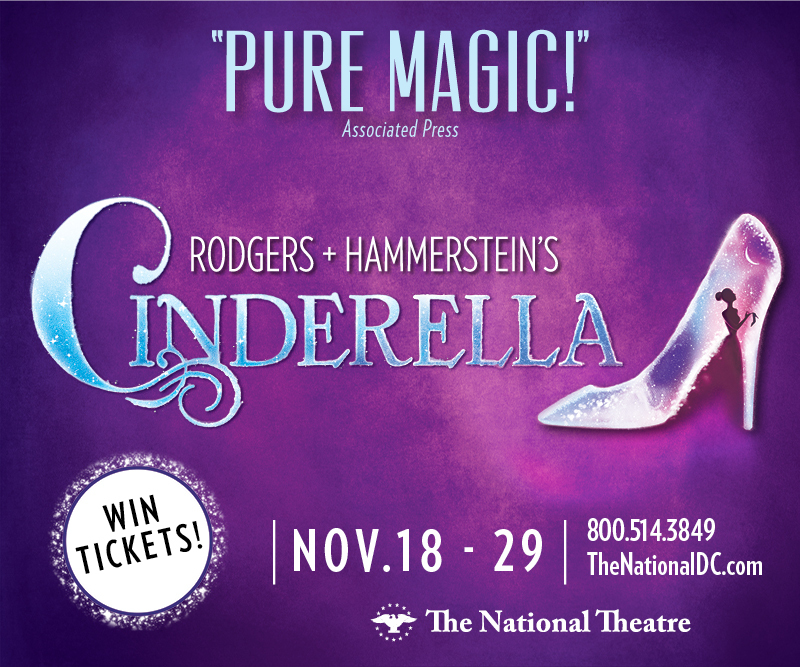 I am so excited to have the chance to take my musical-loving daughter to see Rodgers + Hammerstein’s CINDERELLA at The National Theatre in Washington, DC on opening night! And even more exciting (for you, at least!) is that I get to send two of my readers to the theater, too! Note: tickets (for a reader and for me) have been received in exchange for posting about the show and hosting this giveaway. All thoughts are my own. The 2013 Tony® Award-winning Broadway musical, from the creators of OKLAHOMA!, Carousel, The King and I, South Pacific and The Sound of Music, will be playing for a limited engagement at the National Theater in DC from November 18-29, 2015. Some of the wonderful songs from Cinderella include “In My Own Little Corner,” “Impossible/It’s Possible,” “Ten Minutes Ago” and “Do I Love You Because You’re Beautiful?” I’m getting chills just thinking about them! Although Cinderella debuted on television in 1957, I was shocked to learn that Cinderella made its its long-overdue Broadway debut in 2013. Along with CINDERELLA, Richard Rodgers and Oscar Hammerstein’s legendary musicals include OKLAHOMA!, Carousel, The King and I, South Pacific and The Sound of Music. 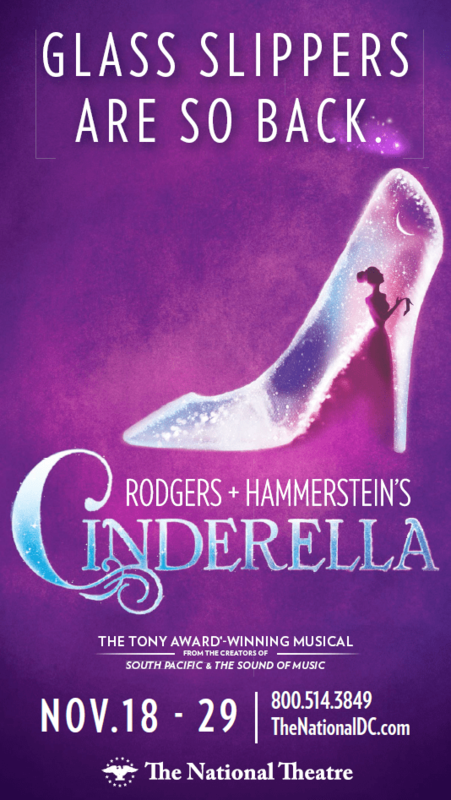 Enter to win 2 tickets to see Rodgers + Hammerstein’s CINDERELLA at the National Theater! Please note that this giveaway is for tickets only, and you will need to find your own transportation to the theater. The winner will be able to choose to see the production on Wednesday 11/18 (opening night). If you’re not within driving distance of DC, then feel free to share this giveaway with your DC/Maryland/Virginia/Pennsylvania friends. Good luck! Please note: there are lots of ways to enter, but it’s totally fine if you simply do the main entry (comment on this post and submit your info via the widget below). The more ways you enter, then greater the chances to win! This giveaway will run through Monday, November 9 at 11:59 ET and a winner will be chosen at random and notified via email. I’d bring my Mom. :) She is a huge Cinderella fan! I would love to take my beautiful granddaughter to the show! I would love to take my 5 yr. old Cinderella loving princess to the show. It is my favorite Disney movie and I’d be honored for it to be my daughter’s first theater performance! I love this show. Even though I do not live in Maryland right now, my niece’s birthday is opening night and I know she would love tickets.